India is an agriculture driven economy. Nearly 80% population is directly or indirectly dependent on the agriculture for earning their livelihood. Hence, it is a vital sector for the development and economic growth of a country and is critical for socio‐economic development of rural areas. The second green revolution benefitted the country by increase in agricultural yield but it lead to many environmental and health issues due to continues and indiscriminate use of synthetic chemicals (pesticides, fertilizers, soil nutrients etc), old irrigation techniques. Need have arisen for use of natural products as pesticides, fertilizers, soil nutrients along with sustainable farming techniques like micro-irrigation, green house, happy seeder etc. in agriculture. Building skills, competencies and capacity of the human resources is receiving priority in addressing the challenges facing Indian agriculture. Given the diversity of Indian agriculture, the demographic profile of our population and more importantly, the scale at which it is required, the conventional methods of capacity building will be of little use. There is worldwide shift from conventional education system to competence based qualification system. The Malwa region of Punjab where the Central University of Punjab is located is hub of agriculture and is known as “bread bowl of India”. The unorganized and intensive agriculture has led to may environmental, health and socioeconomic issues in this region. 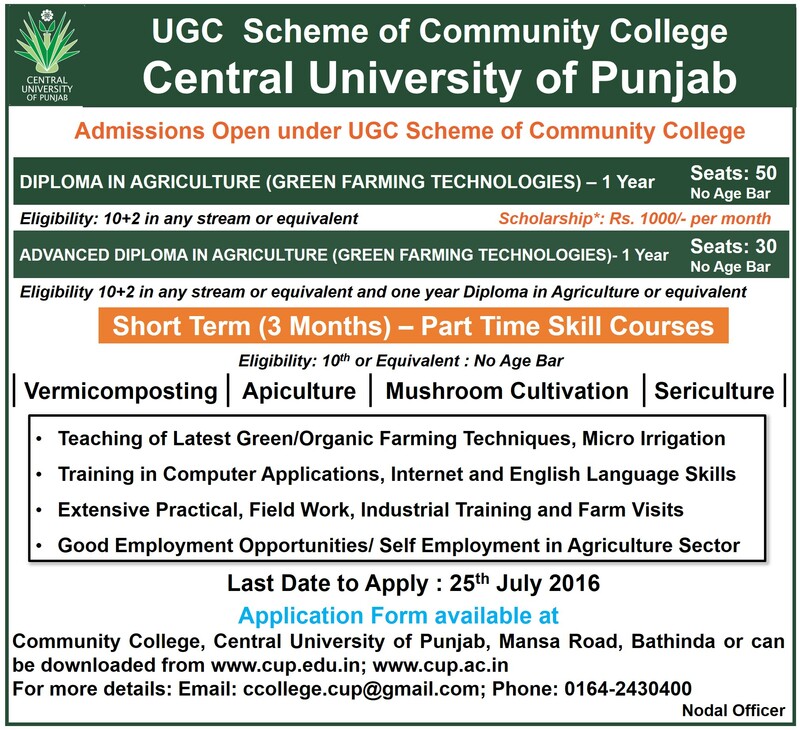 With the objective to provide specialist manpower to meet the challenges of the agriculture sector in this region, the University has started Diploma in Green Farming Technologies”” under the UGC scheme for Community Colleges from the session 2015. Initially UGC has granted a funding of Rs. 65.96 lakh for the two years. The Curriculla and system of certification of the diploma course will align with the National Occupational Standards and National Skills Qualification Framework (NSQF) of Govt. of India. Provide employable and certifiable skills based on National Occupational Standards (NOSs) with necessary general education to Senior Secondary School pass-outs, with general education and /or vocational education background. Provide opportunity for vertical mobility to move to higher education in future; and to offer bridge courses to certificate holders of general / vocational education, so as to bring them at par with appropriate NSQF level. Provide entrepreneurial orientation along with required skill training for self-employment and entrepreneurship development.